It’s been a rainy week here in Orlando, but we’ve been able to get out and enjoy the parks a bit even so. 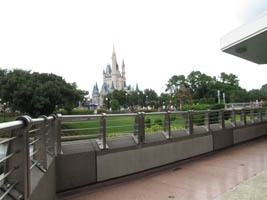 At the Magic Kingdom looking towards Cinderella Castle (below, left), we noticed that new metallic railings had been installed – and it might have happened a little while back, but we don’t usually get into this area that normally is roped off for the dessert party. 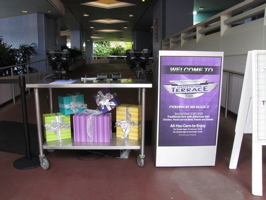 The Tomorrowland Terrace (below, right) is being used for a dinner buffet through the free dining August/September time period. 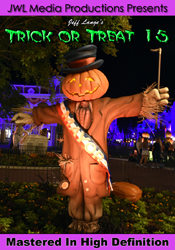 We’ve spent a few hours this week at the Magic Kingdom, I stopped by yesterday as well to get some photos. 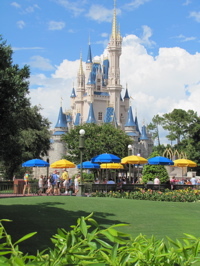 Cinderella Castle (below, left) looked magnificent with the clouds behind it. 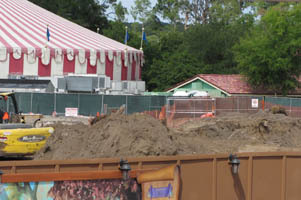 Casey’s Corner (below, right) is still undergoing exterior work. 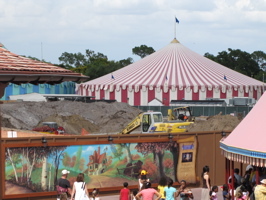 Yesterday we visited the Magic Kingdom to check on the progress in Fantasyland. 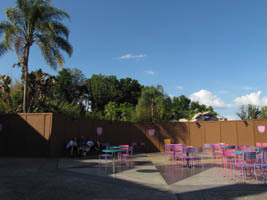 Trees have been taken down behind the wall, and the area is being prepped for the upcoming Fantasyland Forest construction (below left and right). 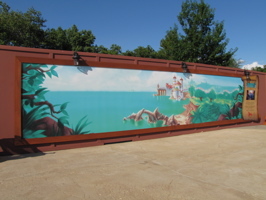 Fantasyland has been undergoing quite a few changes, including the wall being moved to allow for better guest flow through the area. 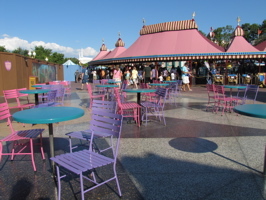 Scuttles Landing is now gone as is it’s canopy – but the tables and chairs remain (below left and right). It’s been a very busy week with family in town, and so much is going on at the parks – it’s been hard to keep up with everything, but it’s been fun trying! 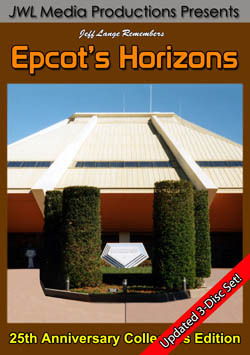 I also released a new DVD last week, Jeff Lange Remembers: Disney-MGM Studios Classics Vol 1. 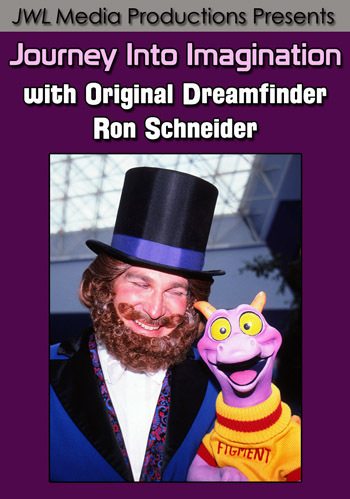 For more information or to order, please click HERE. 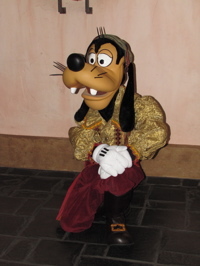 Pirate Goofy made his meet and greet debut in Adventureland at the Magic Kingdom (below, left and right)! 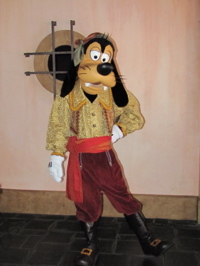 It seems a natural choice to have him next to the Pirate League and he was very well received by the young pirates when I saw him! 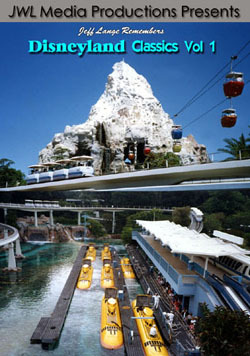 We just attended day 1 of the “Give a Day, Get a Disney Day” press event! 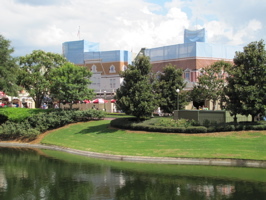 The event was held at the newly re-branded ESPN Wide World of Sports facility. 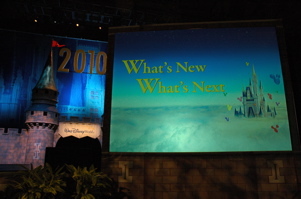 The evening kicked off with the “What’s New, What’s Next” (below, left) media presentation. 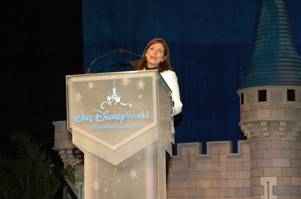 Meg Crofton, President of the Walt Disney World Resort (below, right) told everyone about the upcoming “Summer Nightastic“.